﻿ 101 Instagram Hacks- the only Instagram book you will ever need. 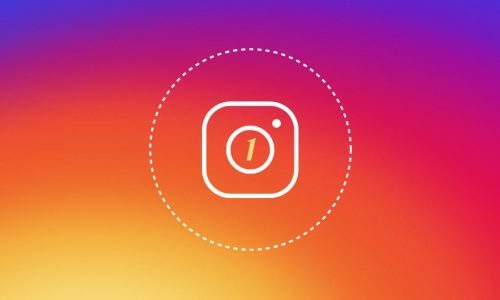 Turbocharge your Instagram account by following our 101 hacks. Packed full of the latest or little-known hacks, this eBook covers everything from your Bio to Insta TV (IGTV). 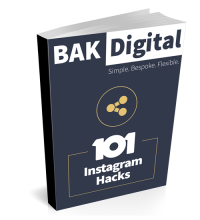 So, if you’re looking to answer the question “How do I grow my brand on Instagram?” or even “How do I grow my business on Instagram?”, 101 Instagram Hacks is the only book you will ever need. 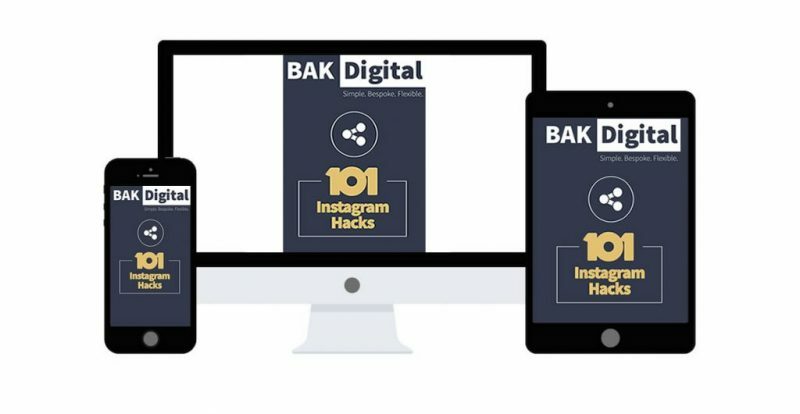 If you’re looking to answer the question “How do I grow my brand on Instagram?” or even “How do I grow my business on Instagram?”, 101 Instagram Hacks is the only Instagram book you will ever need. The book, 101 Instagram hacks, is 33 pages of the greatest insider content in 5 easy to read chapters. Each chapter has its own unique theme and covers a different aspect of Business Instagram for you to master. By following our hacks you will have an Instagram business profile that grows followers and promotes your brand. Let’s take a look at each chapter in a little more detail. The first chapter in the book covers how to get the most out of your Profile, Bio and Links. In 26 easy to understand hacks, Chapter 1 shows you how to set up your Instagram business profile so that it works for your business. Following these insider hacks will ensure your profile has clear business goals and a strategy that allows you to grow your brand and ultimately grow your business. The key to any great Instagram account is content. That is why Chapter 2 is the biggest chapter in the book. It’s all about helping you produce spectacular content for your Instagram Business profile. In all, there are 48 separate hacks in this chapter covering schedules, images, captions, Hashtags, Insta Live and Insta Stories. Follow these simple to use hacks to gain maximum leverage form your content and ensure maximum growth. Great content is king but what’s the point if nobody is seeing it. The key to having your content seen is interaction. Chapter 3 gives you practical hacks to follow to increase your engagement rates. They cover identifying which accounts you should be following and how best to interact with other profiles in a way that adds value to their profile while promoting your own profile and brand. Your Instagram profile does not come with a simple “set it and forget it” option. You will be required to manage your profile to ensure you are getting the ultimate benefit from your impressive content. The hacks in Chapter 4 help you maximise the insights and settings Instagram has to offer. Step-by-step they will ensure that managing your growing Instagram Busines profile is as plain sailing and effortless as possible. The final chapter covers the newest kid on the block Instagram TV (IGTV). Set to revolutionise how we watch videos IGTV basically allows you to make your own TV content and show it off. IGTV is bundled in your Instagram app but is also available as a separate app so it can be used like YouTube. The book dedicates 11 hacks to IGTV allowing you the chance to get ahead of the game and be one of the first to cash in on it’s potential. Why not try before you buy. Hit the button below to see some pages from the book and see exactly what you can learn. Of course, you won’t see all the hacks in the book but just enough to reassure you that we know what we are talking about when it comes to using Instagram. The final chapter covers the newest kid on the block Instagram TV (IGTV). Set to revolutionise how we watch videos, IGTV basically allows you to make your own TV content and show it off. IGTV is bundled in your Instagram app but is also available as a separate app so it can be used like YouTube. The book dedicates 11 hacks to IGTV allowing you the chance to get ahead of the game and be one of the first to cash in on it’s potential. Read 101 Instagram Hacks any device, mobile, tablet, or desktop. It’s a very reasonable price, and I am glad I read it. Downloaded your ebook and felt like I should let you know how much I enjoyed it and how valuable your hacks are. I have since created an account and uploaded my first few pictures using your hacks and am getting a really positive response. It’s a very reasonable price, and I am glad I read it. Thank you very much. Taught me loads of things I never knew before! For anyone who loves online hacks (like me) this ebook is absolutely perfect! I feel a lot more confident. I had a lot of questions about Instagram before reading this ebook, now they’ve all been answered and I feel a lot more confident. Thank you! Felt like my business page on Instagram needed a bit more life to it so had a look through this ebook. I applied these hacks to my page and it looks 10x better than before. I now keep this saved on my computer and am always looking over it when uploading new pictures etc. Thank you BAK. Sam is head of marketing here at BAK Digital. 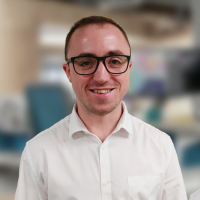 He is basically responsible for overseeing all our marketing activities but with particular responsibility for Pay Per Click and Social media. As well as managing our own accounts he is also principle account holder for a number of other companies who use our services. Sam joined BAK directly after leaving school. I suppose you could say that he eats, drinks and sleeps digital marketing. He has a deep understanding of the subject but manages to explain it in a clear easily understood manner. That may be why he is frequently called upon to speak at business seminars and workshops. So if it is anything digital marketing you need to know about, Sam is your man. 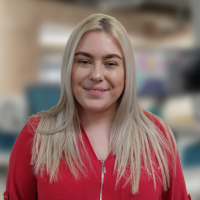 Sarah works as a Digital Marketer at BAK Digital. Her day-to-day activities usually involve blog writing and managing our different social media accounts. You might recognise her soon in our upcoming Instagram Masterclass course, in which you’ll get to see her face, A LOT (sorry about that! ☺). Before working for BAK, Sarah took a Marketing degree. Her technical skills coupled with her hands-on experience make her a formidable force in the world of social media marketing. So, here she is blogging, posting, writing eBooks and delivering courses for a business right in the town where she was born! Lucky Sarah.